This Friday, April 22nd, is the 46th year that Earth Day has been celebrated in the U.S. Although Earth Day has its roots in government policy, we should take it as a reminder of the importance of protecting the earth from the actions of the government and corporations. In the decades since the naming of Earth Day, we’ve seen how the corporate State will bulldoze forests, pollute the air and water, exploit billions of animals, tear apart the land, poison and kill people, and effectively rush us all towards the devastating global impacts of climate change—all in the name of power and profit. Even though the fight back against the executives, politicians, and money that run the world can be a fight filled with pain and heartache, it’s a fight that we must feel compelled to engage in. For many people, they deeply feel this necessity as their survival and the survival of their communities depend on it. For other people, privilege may offer a buffer to feeling the impacts—but being in a position of less risk should be taken as an obligation to take effective action. 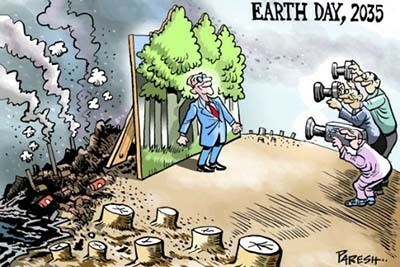 In light criticism of the notion that one day a year is designated as Earth Day, people often say, “Every day is Earth Day!” Indeed, it should be—but not an Earth Day marked by consumer-oriented festivals, green branding by corporations, and photo-ops for politicians. Rather, every day is our chance to do something more to push back. It is scary how limited we are with how many days we have to do so before the earth—and its inhabitants—are lost to climate change. Climate change is already causing disease, death, and destruction throughout the world…and we don’t have days to waste on the State-sponsored version of Earth Day. We have to make each day actually count with effective strategies and organizing, broad networks and strong coalitions, and a dedication to not giving up the fight. Celebrate Earth Day with the CLDC by requesting your FBI file! The Civil Liberties Defense Center works to provide legal support and resources to people who are working to defend the earth. This Thursday, we will be hosting a FOIA workshop entitled “FOIA for Earth Defenders,” to help individuals and organizations learn about how they can use the Freedom Of Information Act to request documents from the federal government. Learn the basics of the Freedom of Information Act and other State public records laws, and then apply that knowledge to your activism. The CLDC will be assisting people in requesting individual or organizational files from the FBI and other federal agencies. CLDC will then follow through and assist people with the administrative review process and if necessary (it’s always necessary), the new CLDC attorneys will initiate a group FOIA lawsuit in the event the agencies don’t comply with the law and hand over documents, photographs and more. This workshop is open to the public, donations accepted. Translation available upon advance request. This workshop will be live streamed online at http://www.youtube.com/c/CLDC2003/live for those who can’t make it to Eugene. What to bring: laptop, notepad and pen. We often talk about what we’re fighting against, but let’s keep what we’re fighting for close to our hearts and let the earth be our motivation to save it.